The StudioLogic SL MIXFACE is a control surface meant to be used with DAWs, such as Pro Tools, Logic Pro X, Ableton, and others. It features a mobile design, so you can bring it with you to any studio you wish, so long as there's a USB or Bluetooth connection at your destination. Working wirelessly, the unit is powered through three AAA batteries. If you hook it up to your computer, it's bus-powered over USB. 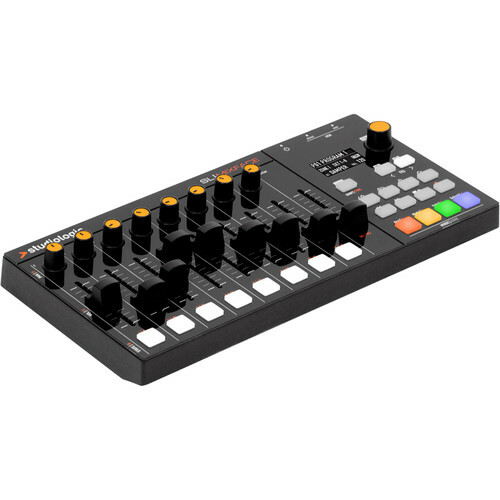 The controller offers eight track faders, one master fader, and a comprehensive transport section for basic DAW functions like play, record, next/previous track, and cycle. Each track gets its own fader, knob, and button, and these functions perform differently depending on how you've set the controller up in your DAW. The controller offers four zones, with sixteen sets in each zone, and twelve presets. An OLED screen offers you streamlined visuals at the top of the controller. A USB cable and an anti-slip desktop pad are included. A full list of compatible DAWs is listed below.